Most of the time, I don’t give tree roots a whole lot of thought. But I think about tree roots plenty when I trip on one (a perfect opportunity to use John Larroquette’s timeless line from Stripes: “Have that removed.”). 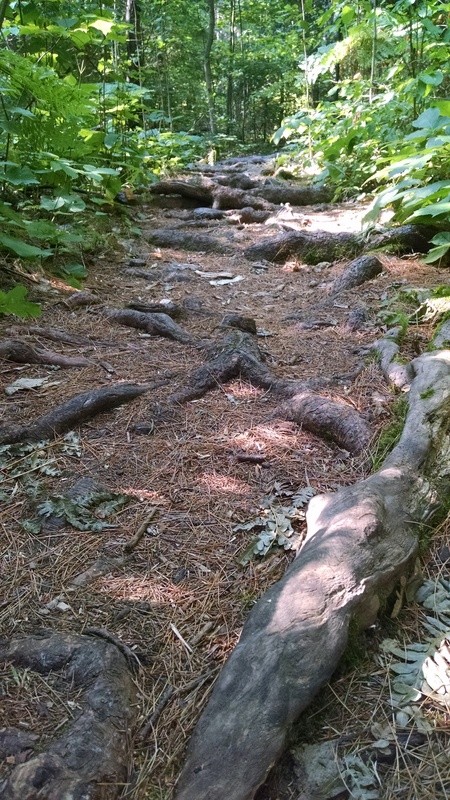 I think about tree roots when I’m riding over them on my bike. When I’m bouncing along and every other sound out of my mouth is “ooohff”? That’s when I think about tree roots. 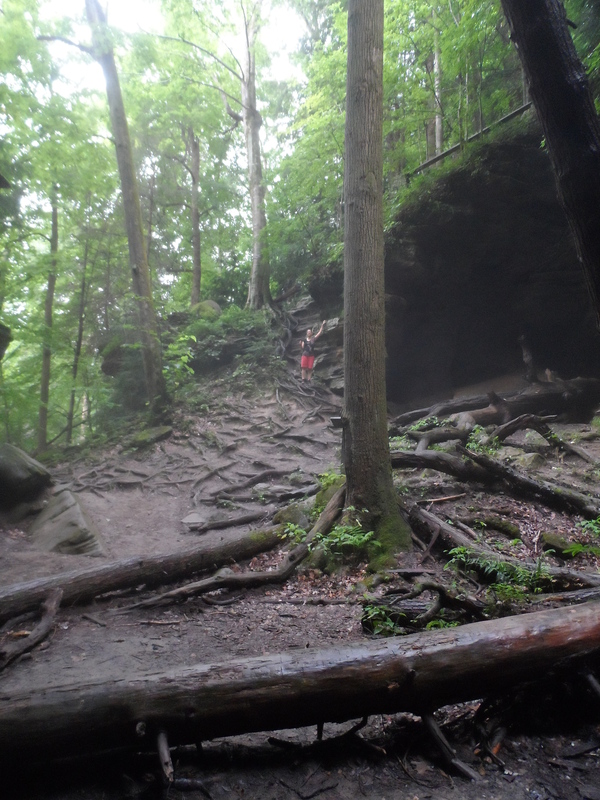 On our trip this summer, we saw roots everywhere: on the trails, curving around rocks, clinging to river banks and lake shores. We saw the roots of up-ended trees fanning up toward the sky with the awkward vulnerability of a teenager who’s tripped and fallen in a high school hallway. When I’m bumping and tripping over them, I think of roots as solid and fixed, grasping the earth to keep the tree upright. But of course, roots aren’t that way at all. Roots are alive and growing and finding their way through soil, around rocks, always deepening their connection and finding ways to offer support and nourishment. 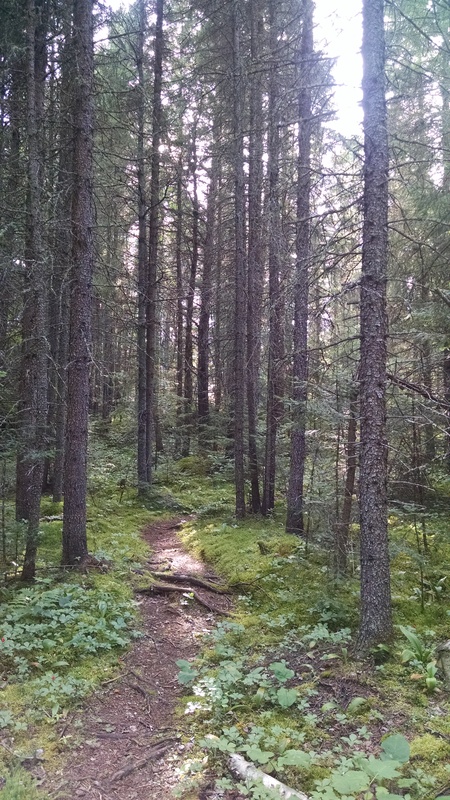 Rigid, solid roots would serve the tree no better than rigid feet would serve us. Feet offer stability and make it possible for us live upright. Tight, tense feet that live in ill-fitting shoes are unstable feet – and are likely attached to an uncomfortable person. A couple of years ago, I noticed I tense and lift my big toes a lot when I walk and when standing I often “grab” the floor with my toes. No wonder balance is a challenge for me: my feet are holding on instead of relaxing down. Check out how much tension you hold in your feet. Relax your feet and toes, and your whole body gains stability and mobility. You might also smile more. One misconception I had about tree roots is that they mirror the branches above them. I always imagined that roots reach down as far as branches reach up. Instead, most tree roots grow out more than down – mainly in the top 18 inches of soil where the most water and nutrients are available. Imagine a wine glass standing in the middle of a dinner plate. 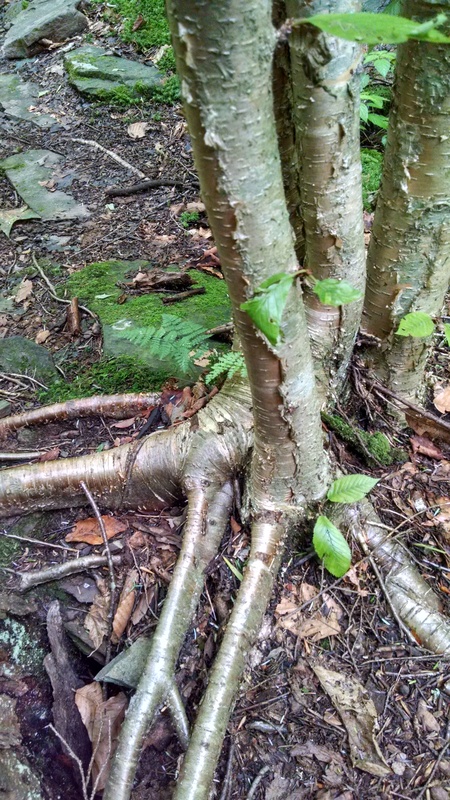 Roots create support and stability by spreading wide. Except for maybe in super soft sand, our feet can’t really dig down, but they can spread out. Notice if, like me, you roll to the outside edges of your feet (you can also look at the wear on the soles of your shoes to see if you have this tendency). The inside of foot — heel to big toe and third toe plus the arch that spans the space between — is the most stable. As you stand and move, focus on pressing down through the big toe mound to engage the muscles and connective tissue in your feet and legs that offer you stability and relaxation. You can also pay attention from the top down: if any body part above the base is tense, this is a sign that the base isn’t stable and relaxed. When our human bodies are moving easefully and efficiently on the earth, our feet and legs are in this state of resting but ready each time we place a foot on the ground. The foot’s intricate architecture of 26 bones, 33 joints, 107 ligaments, 19 muscles plus connective tissue all allow it to move, be still, and balance on sandy, grassy and rocky terrain. When we say “stability” sometimes it’s mistaken for solidity or rigidity. Instead, every step and stance is alive with powerful and readiness for whatever movement may (or may not) come next. Nature knows how to make a tall life form like a tree or a human stable and resilient. 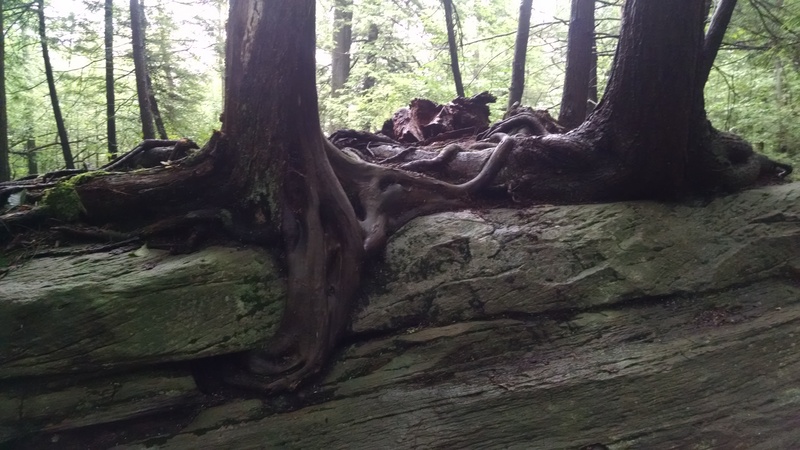 Awareness and intent can let your roots come alive. Plus, more resting but ready, means less tripping over tree roots.